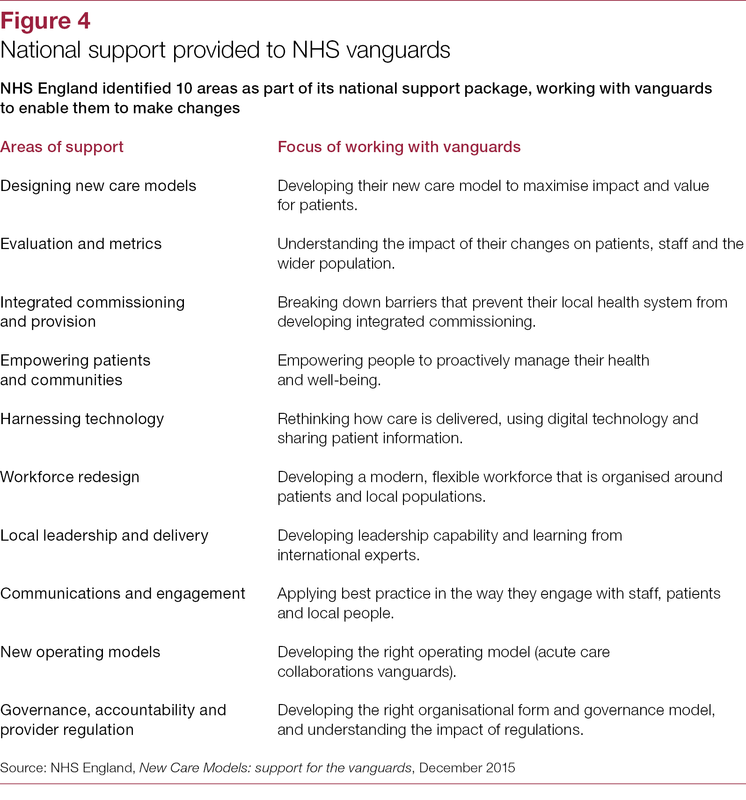 In 2015, NHS England selected 50 sites to act as ‘vanguards’ to lead the development of five new care models. 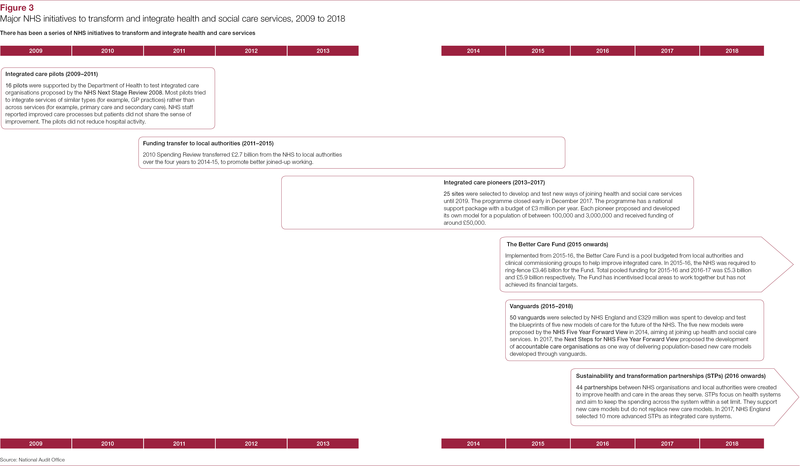 The vanguard programme is another attempt by the NHS to transform and integrate health and social care services, following the integrated care pilots and the integrated care pioneers. The vanguards were intended to be locally driven pilots but each would contribute to the development of care model prototypes that could later be replicated rapidly across England. 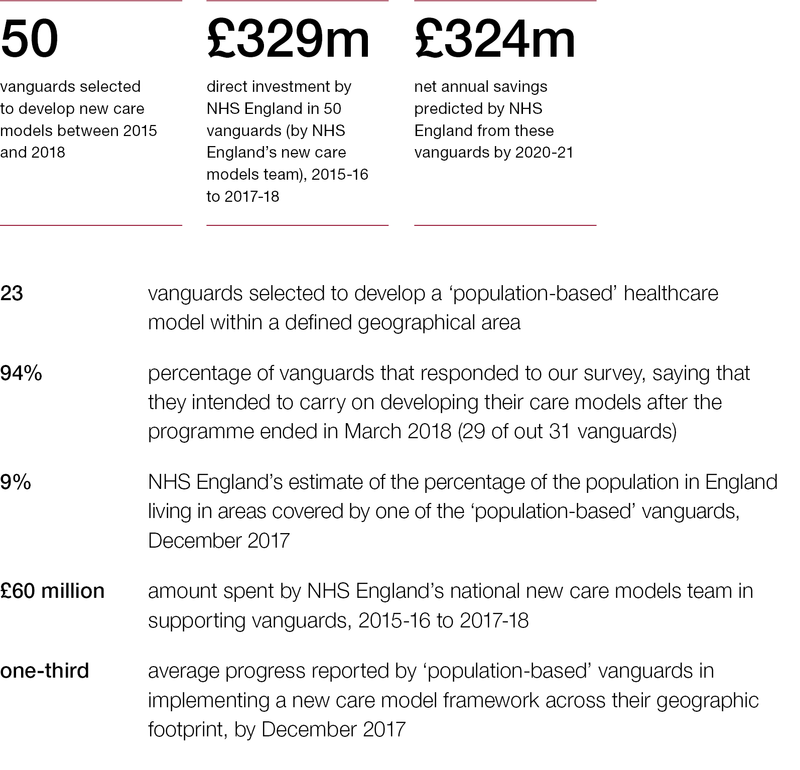 Since 2015, NHS England has provided a total of £329 million to the 50 vanguards to support them in testing their proposed new care models. 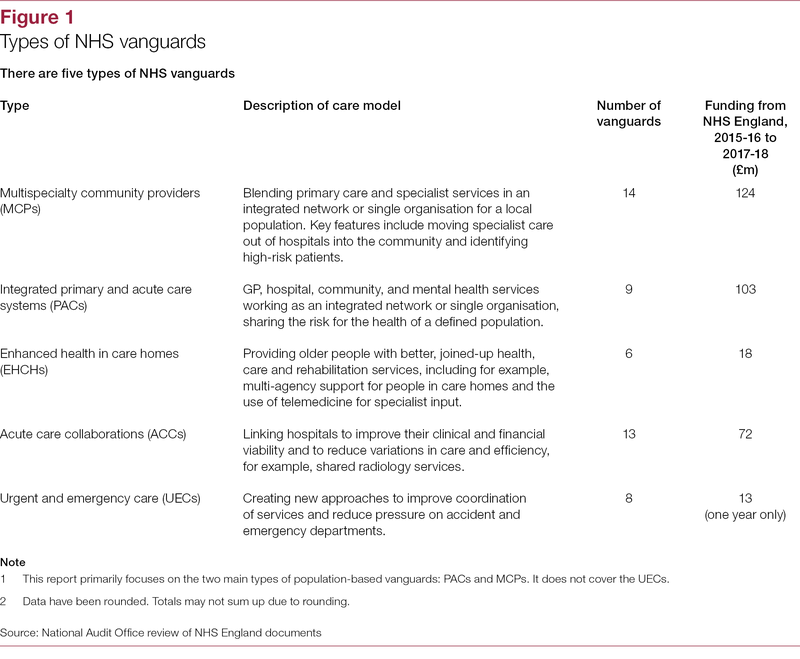 NHS England also spent another £60 million on its new care models programme, which supported and monitored the progress of vanguards. 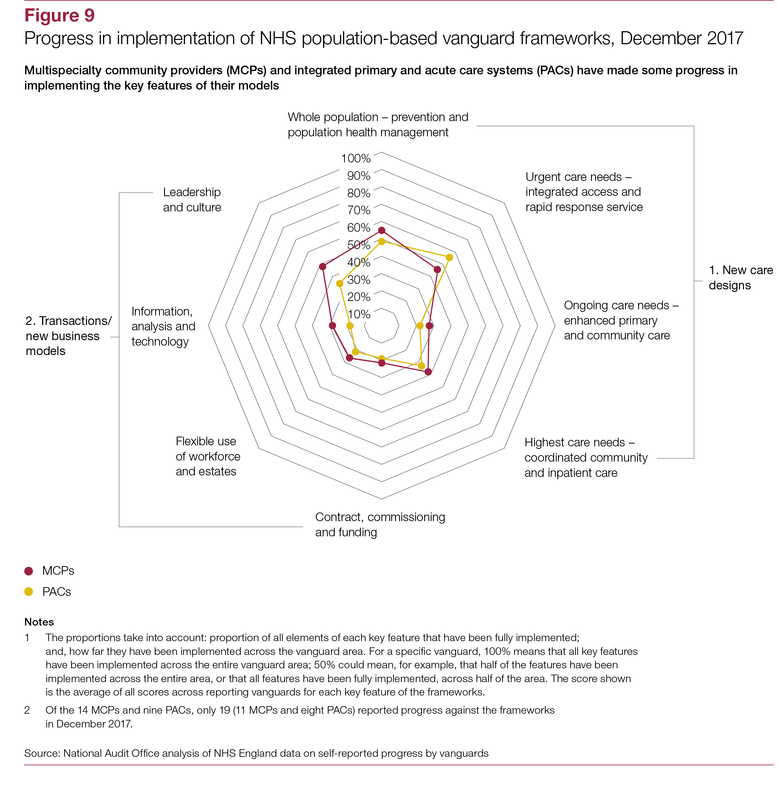 The vanguard phase of the new care models programme ended in March 2018, by which time NHS England expected individual vanguards to be sustainable without further national funding for transformation. Responsibility, along with some members of the new care models team, was passed to NHS England’s new System Transformation Group. 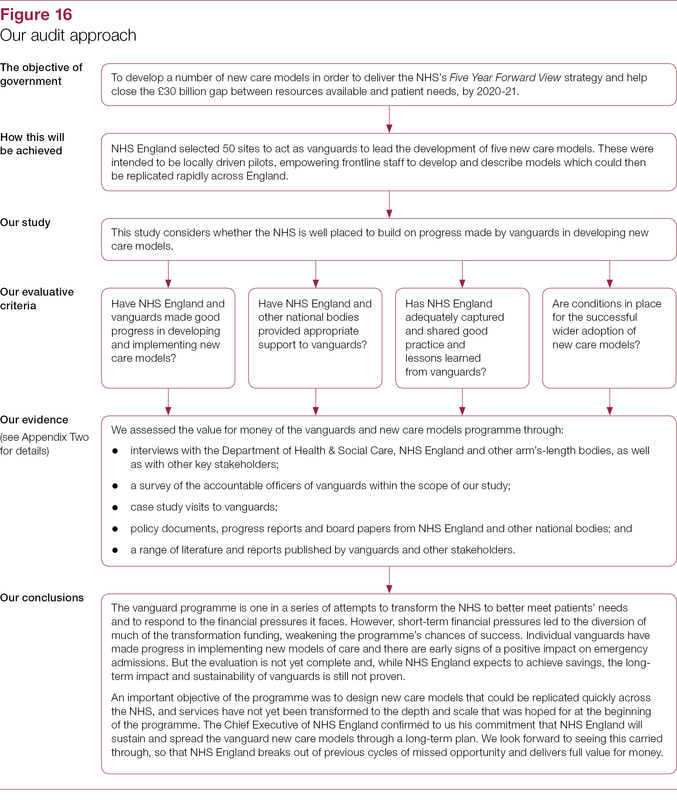 readiness for the spread of these new care models (Part Four). 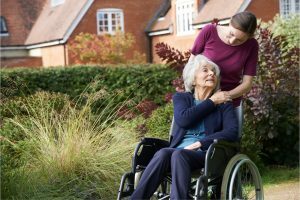 This report focuses primarily on the two types of vanguards which were designed to test integrated models of health and social care for a local population: integrated primary and acute care systems (PACs) and multispecialty community providers (MCPs). The report also covers the six enhanced health in care homes (EHCHs) vanguards and the 13 acute care collaborations (ACCs) vanguards. 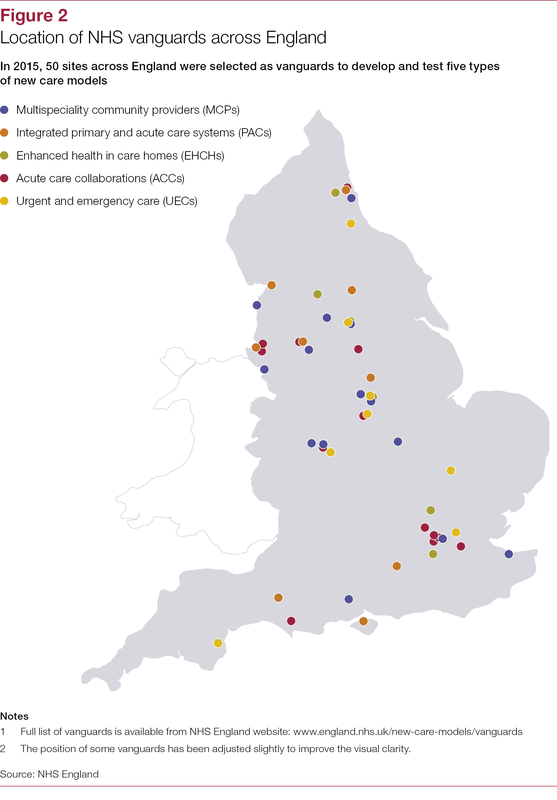 We excluded from our report the eight urgent and emergency care (UECs)vanguards, which were all moved to another part of NHS England after the first year. 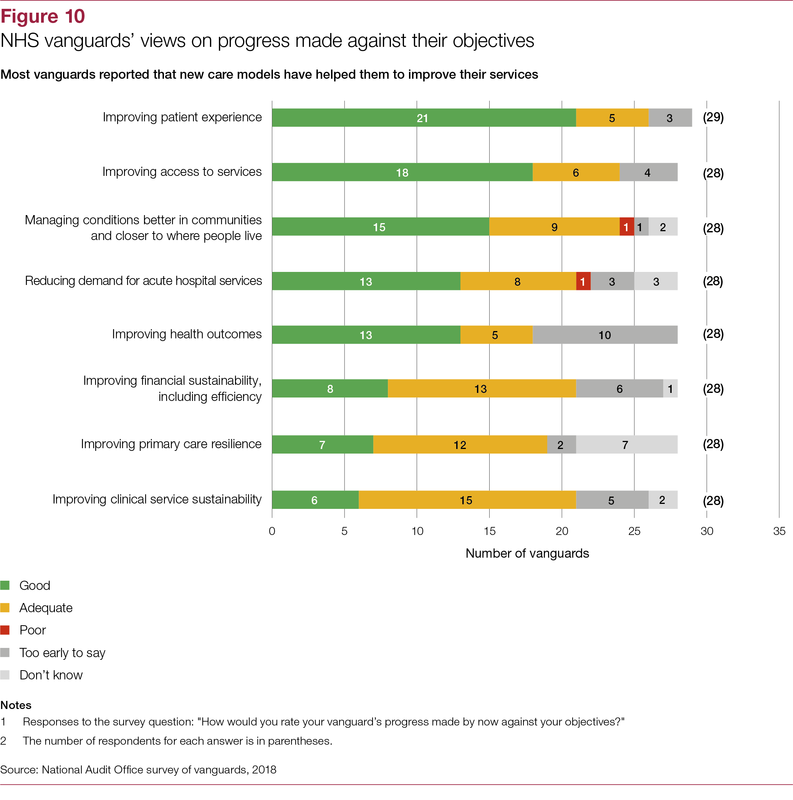 The vanguard programme is one in a series of attempts to transform the NHS to better meet patients’ needs and to respond to the financial pressures it faces. However, short-term financial pressures led to the diversion of much of the transformation funding, weakening the programme’s chances of success. 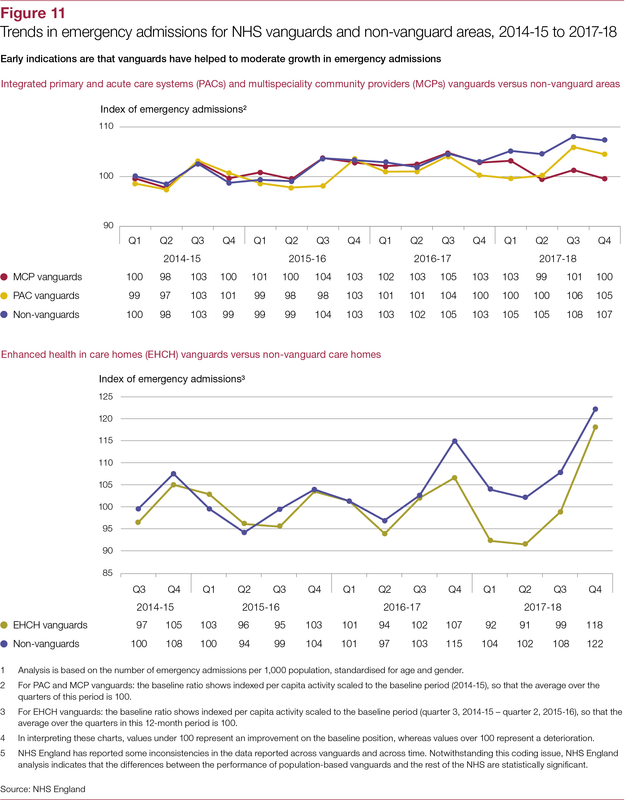 Individual vanguards have made progress in implementing new models of care and there are early signs of a positive impact on emergency admissions. 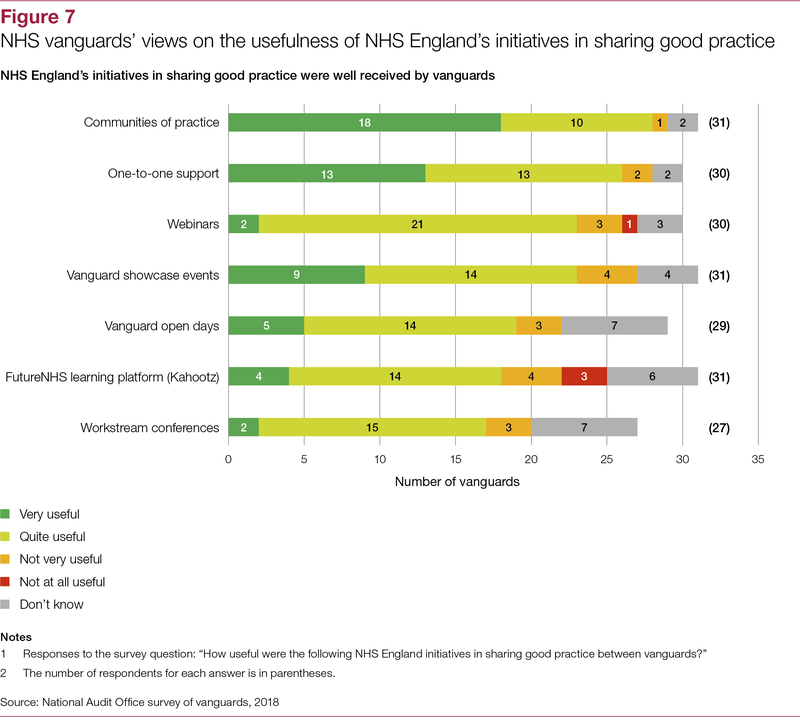 But the evaluation is not yet complete and, while NHS England expects to achieve savings, the long-term impact and sustainability of vanguards is still not proven. 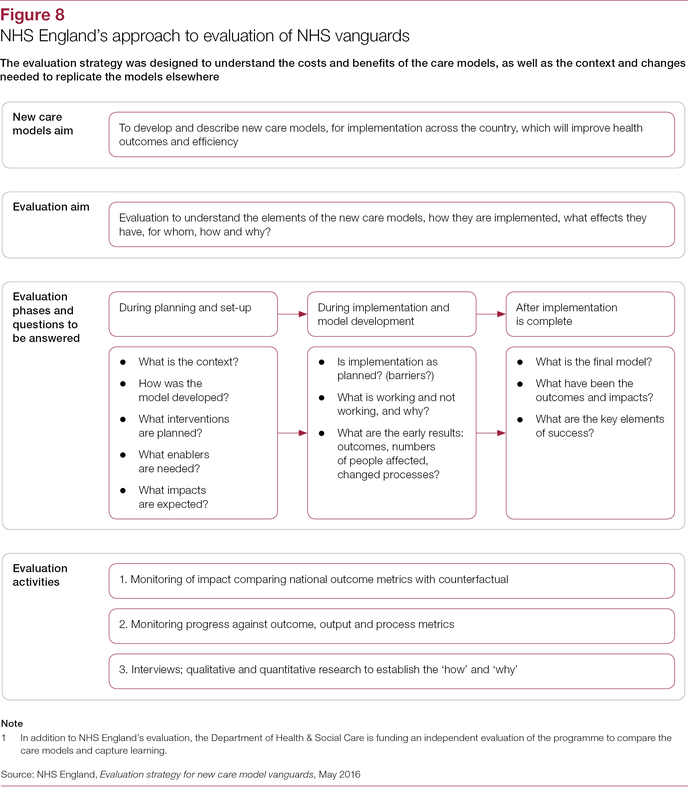 An important objective of the programme was to design new care models that could be replicated quickly across the NHS, and services have not yet been transformed to the depth and scale that was hoped for at the beginning of the programme. The Chief Executive of NHS England confirmed to us his commitment that NHS England will sustain and spread the vanguard new care models through a long-term plan. We look forward to seeing this carried through, so that NHS England breaks out of previous cycles of missed opportunity and delivers full value for money.